I think I should have been born Spanish. Tapas definitely appeals to my inability to make a decision. I hate going to a restaurant where I want to try just about everything on the menu and have to commit to one dish per course. If I luck out on what I choose, then fantastic. But if I pick something and it's below the par of my expectation then I spend the rest of the evening (or if you ask my husband, the rest of the week) mithering on about how I wish I'd chosen something else. Give me a restaurant where you have three choices per course and only one of those is chicken or vegetarian and I'm happy. On the other hand, I love tapas. Because you can order lots of little portions of different things without feeling terribly greedy and if I don't like one thing, there's always something else I'll like. Plus I can order something I'm not quite so sure about and if I like it, then happy days; if I don't then I can just compensate myself with an extra spoonful of something else. When we first moved to the sticks, there were only Chinese or Indian restaurants in town. Italian was limited to Pizza Express - and at a push you could just about say that Pizza Hut was the alternative. Or fish and chips (which Buckles do very well thank you). Anything else and you had to travel. We now have a lovely tapas restaurant, which I'm dying to try. But I just know it's not the husband's type of place and being a full time working mother, there's just been no time to cultivate relationships with other women* in order for me to suggest it as a venue. So today, given that it was meant to be sunny and I had the house to myself for a whole hour and a half (the child was having her nap, the husband was out) I decided to make myself patatas bravas to go with the six grain loaf** I'd knocked up earlier. 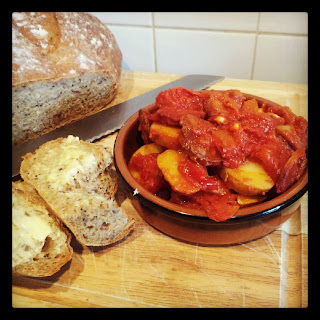 The recipe was simple enough - a bit of chopping; pop the stuff in the pan; wait impatiently for it to cook; get disturbed by husband coming home early; don't eat as planned due to domestic issues; stand in the kitchen later on eating cold patatas bravas straight from the pan and consequently feel sick from overeating. Really really liked it and it's a great way to use up leftover new potatoes. We rarely use them and I normally end up letting half the bag go rotten. So now, I will be really good and use them up making patatas bravas instead. The only thing missing was the sunshine and a glass of chilled white or Rijoa. There's always a next time. *I do know other mothers but most of them either make me feel totally inadequate for working full time or just make me want to stab myself in the eyeball with a fork with their competitive mothering antics. And if any of them read this blog, I'm sure they'll dislike me even more! **Flour purchased from Wessex Mill. First time I've made a brown loaf that the husband has liked. Result!